Our family loves amateur sports. Almost all of the grandkids, which are old enough, participate on some type of team. One is a dancer, two play baseball, two more play football, another plays basketball and one is a cheerleader. Boys and girls alike, they all play sports. And almost every weekend a similar scene plays out…. A game is played, then the jersey wearing warriors pile in the car to head home, or maybe to get ice cream with Nana and Paw Paw. She learned after that first game to take the footballers a change of clothes so they could shed the dirty foul smelling uniforms and put on fresh clean clothes before gathering in her car. 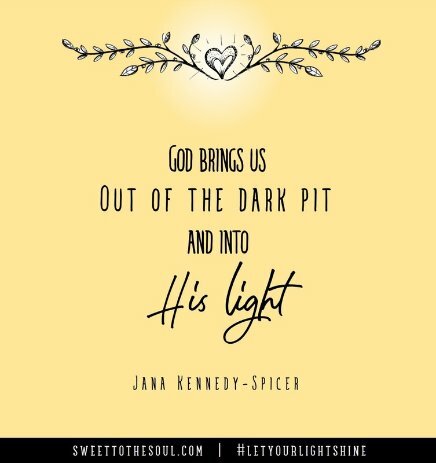 Just like these kids needed to shed their dirty clothes, we are also called to “cast off” the works of the darkness and “put on” the armor of light. In Paul’s letter to the church in Rome, he covers many topics. In today’s scripture, he is encouraging the church to cast off or cease their sinful actions and put on the armor of light to fight the spiritual battle of temptation. He also uses a similar example in his letter to the Christians living in the small city of Colossae. In Colossians chapter 3 we are taught that because, as Christians, we have spiritually died to our old self and have been reborn in Christ, we are to “put to death what is earthly” (vs 5). We then find in verses 5-9 a list of examples of the “works of darkness” we are to shed, or take off. The imagery here is that we have these actions and attitudes which we wear. And just like we select what clothes we are going to wear each day, we also select which actions and attitudes to wear – will they be sinful, of the darkness, or glorifying to God, of the light? Paul is telling us it is time to clean out our closets. To get rid of all of those old sinful ways, to toss them so we don’t even have the option to wear them again. It’s like spring cleaning in the closet of our heart. The word he uses for “cast off” is strong. It means more than just removing them, but to renounce or disown them, to give them up entirely, to reject them. That is a lot more permanent than just switching our wardrobe out for a season. Every so often, but not near enough, I clean out our closet and remove the clothes no longer worn so they can be donated for someone else to love. But there always remains this one section of t-shirts. Most are old and worn, and I no longer wear them, but they carry some good memories. Just like our home closets need to be regularly cleaned out, so do our heart closets. Maybe we’ve welcomed in a new sinful attitude. That sweater of bitterness is starting to be something that we live in. Or maybe it’s not anything new at all. Maybe we keep hanging on to that old t-shirt of rejection and hurt feelings. We don’t wear it every day but some days we take it out just to look at it and remember. Paul understands that if we cast off these, then we need to put on something else, because he doesn’t leave us spiritually naked. 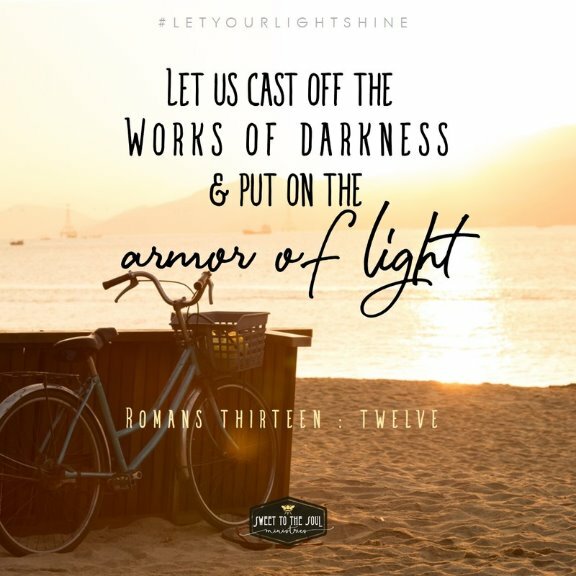 After we remove “the works of darkness” he encourages us to put on “the armor of the light.” We need to suit up in the weapons we need for our daily spiritual warfare. In Ephesians 6:10-18, we are given the full list of spiritual armor God provides for us to wear into battle. But, right now, let’s take a look at the actions and attitudes we need to switch out in our spiritual wardrobe. Did you notice when reading through those lists that each action or attitude directly impacts how we relate to each other, to fellow Christians and to those outside of our faith? Just like the players on my grandson’s football team are recognized by their uniforms, so are Christians recognized by what we wear, by the external expression of our internal spiritual wardrobe. 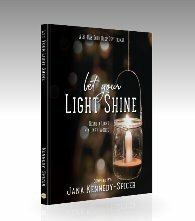 Do we wear the sins of darkness or the light of new life in God? I think it may be time to clean some old things out of my spiritual closet, to let in the light. Dear Lord, we thank you today for the guiding light of your word and all of the knowledge it imparts. Lord, we sit today in need of a new wardrobe. Guide us and help us to clean our out spiritual closets, to cast off the darkness and to put on the armor of the light. Thank you for revealing these truths to us. In Jesus’ name, Amen. Jana! I'm loving every. Single. Devotion! Each one is speaking to my heart in a fresh way, through familiar....I love that! Thank you Jodie. Even though I have read each one several times, they are speaking to me in a fresh way too!